Lately, I have been much into Indie music with that electro-synthpop touch and right now, the bands I am currently loving is, of course, number one on my list is The 1975 (which I got to meet and hug, BTW!!! Will post the details soon), Chvrches, Capital Cities (will blog about this soon! ), The Naked and The Famous, among others. I found about Chvrches through an indie + chill or something like that playlist via 8tracks--which I have been using for a year already, yay! Visit their page for playlists that will suit your taste. :) You can even create a mixtape or what you call nowadays "playlists"! 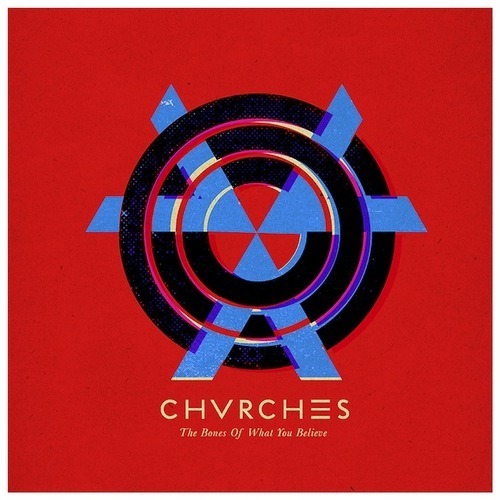 So first things first, let me introduce you to Chvrches. They are a Scottish synthpop band with an alternative rock and electropop twist, which made me listen to their album, "The Bones Of What You Believe" right away! Their music was so catchy and dreamy with that 80s sound which makes you dance and at the same time, sings along with it. 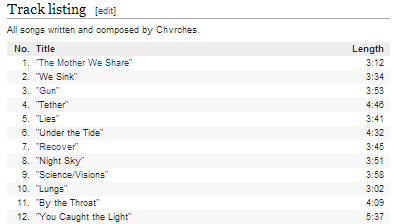 This is their track listing, according to Wikipedia. Just a few weeks ago, Coachella happened--which I am so bummed for not being there--but I still got to watch Chvrches perform their hit song "The Mother That We Share" through Coachella's live streaming! I got to watch The 1975 live too, even though I am a million miles away from the festival. Thanks to you, internet!